I rush to the platform assigned to my train. Hurried, I pass between beggars and confused tourists. A pigeon swoops down, very close to my face then darts upwards at a steep climb. My eye follows the bird giving way to stop on a perch high above the ground. I pause, stop walking. Above where the bird stopped to rest is a massive mural of a scene entirely relevant to my travels that day. Soldiers dressed in their bright blue and red uniforms boarding a train. A crowd around them rejoicing and crying. Their families, perhaps, a soldier hugs a woman, children stand in awe. It is the departure of the French Army from this very station in 1914. I was on my way to Verdun, a city with a mystic quality in the laurels of French history. Close the German border, Verdun is a place where the terrain favors the defender and rolling hills protect the city upon a hill. After the French defeat in 1871, the government decided to build a series of massive forts to protect the city from attack. Insatiable amounts of money were spent to turn the surrounding hills into artillery forts, machine gun nests, and observation posts. On the train I flirted with history, imagining how the soldiers must have felt being rushed to these defenses at the outbreak of war. Verdun was the most fortified position in the world in 1914, perhaps they were confident, or scared. I could not come up with the right feeling. As the sun started to warm the land, the image of the countryside became ever more visible. Rolling foothills, small villages, large factories. The train station at Verdun was quiet and empty, I was one of four exiting the train. It was cold and there was a gentle persistent rain. I had made this trip with very little planning but knew my first stop was the tourist office. It sat on the opposite side of the river beyond the city center. I trudged along, stopping briefly to admire monuments erected for the sacrifices of the Republic. The city itself, on the first day of German shelling, had been destroyed. It is estimated that one million artillery shells fell from the sky on Verdun and her fortifications on the first day of the siege. When I arrived at the tourist office, I informed them that I would like to see the battle site and that I needed help help acquiring transportation. A taxi was called for me, which arrived 10 minutes later with a loud honk. We made conversation and the driver told me about the utter destruction of Verdun. “This all used to be farmland, no forests at all,” He said. I looked into the forest as we were driving. There were strange hills within the land itself. The ground was uneven but the forest adapted to the situation. We arrived at Memorial of Verdun only to be blocked on the road by a large caravan of tourists from Germany. While the museum exhibit was quite interesting, my fascination was with the destroyed ramparts and trenches that had made up this land some 100 years ago. With my map, I laid out a course for Fort Douaumont, the mightiest of the defenses. It was 3.5 kilometers away, a fair distance but the rain disheartened me. I asked a young man at the desk if he knew a route that would provide cover from the rain. He suggested taking a hiking trail in the forest that ran alongside an old communications trench. I obliged him and set off. As I made my way into the forest, a silence came over the land, a silence full of sound. The rain falling on the leaves, birds chirping, frogs croaking. Small wildflowers, perhaps on their last bloom of the year welcomed me into their most peculiar of domains. The beauty of the forest contrasted with the old scars of trench lines and massive shell holes made for an exciting walk. I encountered no one on the trail and found myself pausing to catch my breath after an incline had tired me out. I paused to light a cigarette reflecting on how in this very trench in front of me perhaps a French soldier, would have done the same. In the rain and the cold, huddled down in their trench, the simple relief provided by tobacco would have been most calming. I descended down into the trench, it was remarkably dryer than I would have thought. I finished my cigarette and looked further up the hill. At a great distance, I could see a sea of white, I was curious, why was this unnatural color there? I ascended further. To my surprise, I came across thousands of white objects. Most were crosses, others bared the star of David. Some 700,000 soldiers died at the Battle of Verdun. Many of them were interred in the earth where they fell. These graves paid homage not to individual soldiers but to the thousands lost at Verdun. The battle lasted for 300 days and nights, 3/4 of the French Army saw combat at some time over the course of the battle. The reason for my visit, however, was more expressly to see the ruins of Fort Douaumont. The pride of France, the fort was intended to keep the Germans from crossing the Meuse and sacking Paris, as they had done some 40 years before. Constructed on a naturally defensive position, the fort had a commanding view of the area. Yet by the time the First World War started, it was already out of date. German heavy howitzers could pierce the forts thick armor if a continued barrage was not stopped. The French High Command decided that it was best to move the French artillery pieces from Douaumont to Belgium in 1914 since they were needed desperately. As the war fell into a stalemate of trench warfare, the fortifications at Verdun had not seen much action and were manned by older reserve troops. They were stripped of their armaments and thought not to be a target. The German High Command had other ideas. They realized that in order for them to win the war they would need to “bleed the French white.” An attack on Verdun, the pride of France, would divert French troops and armaments away from other fronts and bring about mass death. On 21 February 1916, the German 5th Army led by Crown Prince Wilhelm of Germany unleashed a massive barrage on the city and fortifications. The French and Germans fought back and forth over Verdun for nearly a year, Douaumont was in the center of this fighting and was utterly destroyed. As I emerged out of the forest into a parking lot full of cars, I looked up at the fort. The first thing to catch my eye were the French and German flags flying in unison with one another. They framed the flag of the European Union yet it was not secured and dangled lower than the rest. The irony upset me. There is not much to say about the present state of the fort except that it is entirely in ruins. Large fragments of the structure lay beside it, blasted away by German and later French artillery. I climbed on top to get a better view of the surrounding countryside. The forest celebrated its coming hibernation with bright yellows, reds, and oranges. I took out my phone and opened up a compass, directing my body towards Germany. The conflict that had happened on the spot on which I was standing was incomprehensible. The site was now beautiful, overcome with the most beautiful flora and fauna adapted to their most unusual of homes. The fort now serves as a sanctuary for rare creatures, the shell holes nurseries for amphibian life. 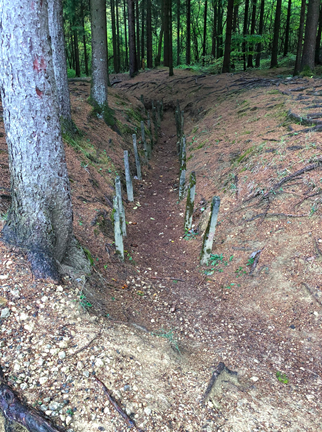 The trenches, now hiking trails. The site is a reminder of the horrors we as humans are capable and sometimes willing to commit. Both Germany and France maintain the site and educate visitors, reconciled to never again allow such a battle to break out. The rain let up as I returned back to the city of Verdun. Sunlight penetrated the clouds and warmed my wet and sore body. Thinking of my contemporary setting, I wondered if war were to break out now, would the earth recover so wonderfully as it had done in Verdun? I leave this thought to you. Our stakes are vast, our weaponry immensely powerful.